Welcome to The Cursed Era, a casual Warrior Cats forum that focuses on the trials and tribulations of a single clan: Treeclan. We are currently a very quiet forum (with much of our conversation happening over PMs), but hope to launch a member-driven plot in the near future - all we need are a few dedicated members, and a handful of interesting characters! Until then you’re free to explore as you will, though please note that much of the site’s lore is member-only. There are also a few non-functional buttons dotted about the site: these will be updated as soon as the corresponding pages have been released. Please note that weekdays are currently our most active times. Weekends (and holidays) tend to be very quiet! Please also be aware that this is the ‘honeymoon’ phase of TCE: as such our existing plot thread merely lays the groundwork for our first roleplays. Additional details will be released in due course. A list of upcoming / in-progress features can be found in this thread, and you're welcome to post here if you have any suggestions for TCE's development/improvement. Alternatively, if you are a guest please feel free to post any feedback you have in our guestbook! We are currently looking for a Senior Medicine Cat and Junior Medicine Cat! Please check our High Positions thread for more information. April 20th - The third part of TCE's history is now up! You can find it here, or by using the Elder's Stories menu. February 6th - A minor tweak has been made to character history requirements. Going forwards, the histories of all characters older than ten moons must make some reference to the Rogue Invasion and other relevant/major plot developments (exceptions made if a character has been part of the clan for less than ten moons). This will not impact any previously accepted profiles, but is hoped to help strengthen the link between future characters and our backstory/plot. January 26th - Information page coding is all cleaned up, and the changes should have corrected our old container alignment issues (some used to be slightly longer than their neighbours). Please let me know if you notice any lingering issues on this front! January 26th - Some of our information pages will be temporarily taken down throughout today, as I will be spending some time cleaning up some of the code within them. Don't be alarmed if you can't access them! January 19th - Please welcome our newest member; Rai! January 13th - We have changed the way we handle NPCs, and added three NPC types--Site, Free Use, and Personal. See this thread for more information! January 12th - Since Proboards mobile disables our main information table, and therefore makes it harder for mobile-dependent users to see what's going on, we now have a dedicated news channel in our Discord! January 8th - Please welcome our newest member; Primzan! January 1st 2019 - Hi folks! As you’ve likely noticed, the last couple of months have been very quiet here, but we’re looking to get back on track again! We’re starting 2019 with a new activity check, so make sure you respond ASAP—and watch this space for fresh updates through the year. Welcome to The Cursed Era! We're currently looking for our first few active members so we can get things rolling. There are four high positions open - see our High Positions thread for more information! We have just released our on-site currency -- this is a testing phase, so payouts may change! All essential information is available for viewing, but please note that work on additional areas is ongoing. Keep an eye on the Information Table's news tab for further updates! Site rules are held here. Please take a moment to read through them before you begin roleplaying or creating characters. This board contains announcements, official polls and discussions, and other staff-made threads. Have a question? Post it here and someone will answer as soon as they can. Post your thread here if you want your characters to move freely between all of Treeclan's features. Note: This board uses generic random events. Please use the other boards if you want a chance at area-specific events. 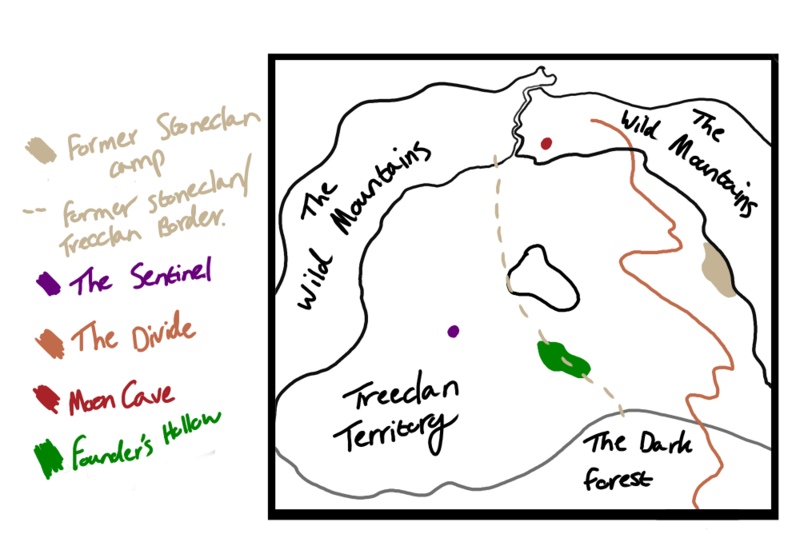 For all roleplays held within Treeclan's camp. Visit Treeclan Camp for more information about this area. The largest beehive in Treeclan territory. Lies near the richest supply of borage in the territory, and provides an excellent honey supply - but also home to some very bad-tempered bees. Visit Treeclan Territory for more information about this feature. A still-living Hazel tree with a hollowed-out interior. This is a popular training spot for Apprentices and Mentors, and proves a rich source of rodents. A region of flat, mostly clear ground found on Treeclan's borders. It's the highest region in the clan's territory, and proves a good sunspot--not to mention a regular supplier of poppy and tansy. An ancient oak notable for being the widest and tallest tree in the clan's territory. Cats who can reach its highest branches are considered master Tree Hunters, and will be recognised as the best in their craft for the rest of their lives. A region of rough plain flanking the gorge that marks Treeclan's easternmost border. The plain continues for a short distance beyond the gorge, but the gap itself is impossible to cross. Visit Treeclan Borders for more information about this feature. The outermost edges of the Dark Forest. Few cats dare to tread here, and none travel into the forest's depths. For those threads that don't quite fit anywhere else. Note: Members are able to post polls in this board. Missed a previous part of our timeline, and wish you could have added your characters into the action? Find yourself wanting to explore a different plot line? Wondering what would have happened if your cat had given a slightly different answer to that big, important question? Use this board to explore these and any other AU events you can dream up! Feel like throwing your cats into a non-TCE setting, or swapping all those felines for something completely different? Use this board to explore all of your non-canon plots! Note: You do not need to create character profiles for your non-canon roleplays, but please remember to follow proboards ToS and TCE's main rules! All old/completed threads are stored here. Post here to advertise a site or request affiliation with TCE. A guest-friendly board intended for general questions and comments. 1 Staff, 1 Member, 20 Guests. Shoutbox quiet? We may be using our member-only Discord - but feel free to post here too! TCE is set many, many generations after the books, rendering the canonical characters distant relics of a largely forgotten past. Life in the Lake Territories soured long before our roleplay’s timeline, and a breakdown of the original clans forced our character’s ancestors to leave their homes in search of better prospects. Eventually these cats found their way to a vast stretch of mountains, and on traversing a long, treacherous pass they at last stepped into a sheltered valley; their new home. The descendants of these founding cats came to identify themselves first as The Valley Clans, and then simply as Treeclan. Although there was once a second clan (Stoneclan) within the Valley, Treeclan is now the only known clan, their neighbours having perished several generations before current events. As such Treeclan now rules all accessible space within the Valley, and they have come to enjoy a comfortable, almost spoilt life: one rich in food and scarce in threat. They seem to have an almost idyllic existence—but with no external forces to keep the clan united, its cats have taken internal dramas to new heights. Leafbare’s last clutches have fully fallen from the Valley, and the new growth of Newleaf is everywhere in sight. The forest and plains alike are awash with the vibrant colours of fresh flowers and young grass, and prey populations are already booming, making hunting a breeze. The early mildness of the season has now matured into a comfortable, stable warmth, and the nights lack their previous chill, retaining a degree of heat right into their depths. In all it’s proving a comfortable, bountiful season, and even the usual rains remain light and infrequent, saving the clan from the damp.